The summer camps are over, Vacation Bible School is in the books, and the last Mission Team returned from the mission trips of 2018. It’s been a great summer of serving and filling hearts with the message of Jesus. 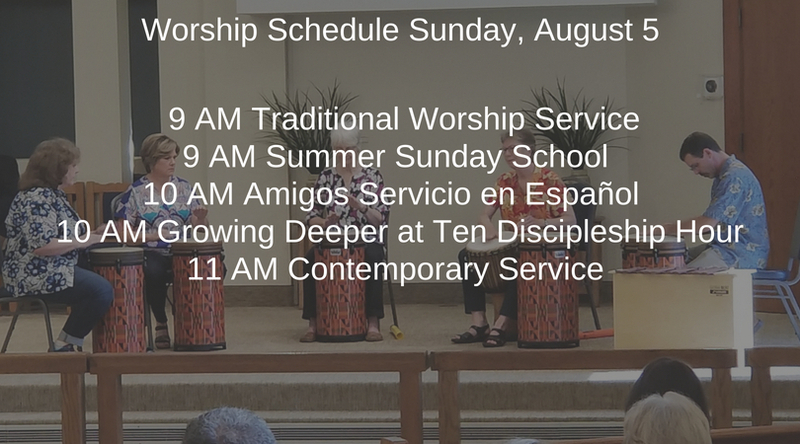 Now as we prepare to enter into August with the new school year approaching, local mission efforts like Backpack Buddies returns; we are getting geared up for our new Sunday School, Deep Blue Connects, and the details of our new season of Growing Deeper at Ten are being worked on. Our new Sunday school curriculum from Deep Blue Kids: Deep Blue Connects at Home With God is designed for kids up to the sixth grade. Seventh graders can sign up to be part of this year’s Confirmation Class. Orientation for our new Sunday school curriculum will take place on Sunday, August 26. the new Sunday school year begins on September 9. For more information or to register, visit our website. Backpack Buddies return Sunday, August 12 with the first packing for the new school year. Backpack Buddies is a program that provides meals for kids to take home over the weekend when not in school and able to access the meal programs provided by the schools. Two hundred “backpacks” will be packed during the Growing Deeper at Ten hour. Donations of items to be put in the backpacks are being received now and can be left at the donation center in the church narthex (lobby). The items needed are individual microwavable meals, juice boxes, milk boxes, instant oatmeal packets, granola bars, and fruit cups.